Okay, I am a HP rifle shooter closing in on DR and an avid pistol shooter in IDPA, however, I am thiking about conventional;/SR pistol shooting. I will shoot primarily with the goal of earning a DR pistol badge.... Am patient, but getting older (eyes...). Piggy bank, well, like most us, is not unliimited. I have been looking around at options for a 45. A Colt Gold Cup (late model) goes for about a grand, and is a ready to go gun, however, I am not certain of its actual utility in BE. Do they meet the requirements for a solid gun? Will one out of the box, with some work over time, get me to MA class/DP? Would I be better off if I build my own (caspian slide/frame etc) for about the same? If you are looking to get a .45acp, a new springfield range officer will give you sufficient accuracy. If you want to go distinguished just change the hammer and grip safety over. If I were in your shoes, I'd pass on the GC and have someone like Dave Salyer build me a ball gun from a Springfield Armory Milspec. A good used ball gun is always an option. Andrew065 wrote: Okay, I am a HP rifle shooter closing in on DR and an avid pistol shooter in IDPA, however, I am thiking about conventional;/SR pistol shooting. You say "DR". This means Distinguished Revolver. If you mean EIC (Service Pistol) that is an altogether different competition. Anyway, In this area (Florida) there are way more conventional NRA matches than either DR or EIC. Shooting a ball gun in NRA Conventional put you at a real handicap. For me, the smarter thing would be to get a wad gun and shoot a lot of NRA matches first. 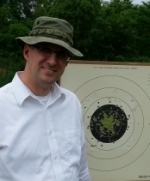 I shoot the DR and EIC only twice a year, at the Dixie Regional, and Camp Perry, but shoot a 900 NRA match every week. You say your goal is to get a Distinguished Pistol Badge. If that is your primary motivation, then I'd suggest getting the ball gun and shoot ball in as many NRA and/or CMP matches as possible. Stick with the iron sights and if possible, get a Marvel conversion with a 4# trigger. You won't win many NRA matches, but you will be on the fast track to the Distinguished Pistol Badge.